Chevy’s selection of work trucks obviously appeal to those who spend most of their days on the job. After all, these vehicles include a number of features that make it incredibly easy to haul and tow construction aggregate, and several mechanical inclusions will make it easy to maneuver around that worksite. However, when you start to explore everything that these vehicles offer, you’ll begin to learn that these rides can also be used as daily commuters. In other words, these Chevy work trucks shouldn’t only be relied on for work. Rather, they’re perfectly good choices for an everyday driver. Among all of Chevy’s work truck offerings, the Silverado 1500 is most often used as a daily commuter. Therefore, it shouldn’t be much of a surprise that the pickup includes some of the top comfort and convenience amenities in the segment. For starters, engineers included dual-resilient foam seats, allowing occupants to sink in and remain comfortable for their entire journey. If you’ve been driving an older model, you’re surely achy following a long drive. Fortunately, this won’t be a concern in the Silverado 1500. Furthermore, if you’ve previously driven a pickup, you surely became accustomed to the annoying howl of the wind that accompanies any trip on the highway. Well, Chevy’s engineers recognized this issue, and they included triple-seal inlaid doors and a new windshield to help reduce cabin noise. The inclusion of the windshield will also help boost aerodynamics, which subsequently impacts performance. Meanwhile, drivers will capitalize on all of the advantages provided by the brand’s MyLink system. Instead of having to finagle with the touchscreen while also operating the vehicle, drivers can rely on the steering wheel controls to access whatever application they desire. Thanks to this feature, drivers can also make phone calls and access the cruise control function. If you are indeed planning on making phone calls during your trip, you can use the USB ports and available 100-volt power outlet to keep all of your gadgets fully charged. 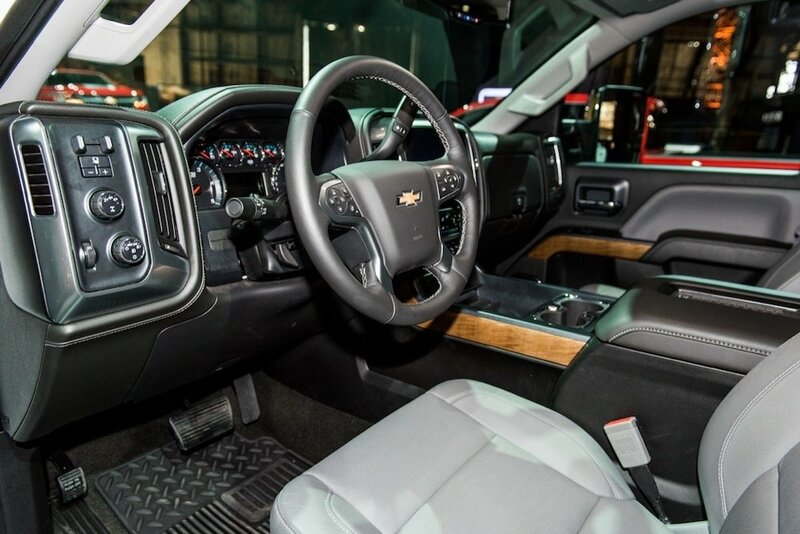 Chevy says that they want their customers to “drive with confidence,” so that explains why engineers added so many features that positively influence this truck’s performance and drivability. For example, inclusions like the Diesel Exhaust Brake System will take some of the deceleration responsibilities away from the driver, as the vehicle will automatically maximize stoppage power in unexpected situations. Meanwhile, the fifth-wheel trailer hitch makes it much easier to attach any trailer or transportation device behind your truck, while the Trailer Sway Control will allow drivers to monitor and manipulate the path of their hauled goods. Normally, a trailer would sway and refuse to stay aligned with the pickup, but the Silverado 2500HD improves the driver’s ability to determine the proper path. The Trailering Camera System will be just as useful when you’re tasked to tow cargo, as the feature allows the driver to monitor their trailer at all times. Alternatively, drivers could simply use the vehicle’s truck bed to transport materials. Fortunately, owners won’t have to worry about compromising their vehicle’s aesthetics, as there are a number of features that will help preserve the quality of the exterior. For instance, the spray-in bedliner is thick and effectively scratch-proof, adding a layer of protection over your Silverado’s actual paint. Meanwhile, the cargo tie-downs allow drivers to secure up to 250 pounds to their bed, assuring that they won’t shift around or accidentally fall out. Finally, the CornerStep rear bumper and LED bed lighting will make it incredibly easy to load and store cargo, regardless of the time of day. Those who opt for the V8 engines on the 2017 Silverado 3500HD might be a bit intimidated by all of the power that the system is capable of cranking out. Well, they shouldn’t worry thanks to Chevy’s inclusion of several safety capabilities that will ensure their safety. For starters, the hulking Vortex 6.0-liter V8 engine delivers an incredible 360 horsepower and 380 pounds-feet of torque. Meanwhile, the alternative Duramax 6.6-liter Turbo-Diesel V8 engine cranks out an eye-popping 910 pounds-feet of torque, which should be more than enough muscle to overcome any obstacle. If you’re worried about your ability to control such a powerful truck, the available Digital Steering Assist should reduce your apprehension. This feature will maximize traction and “road holding,” allowing the driver to maintain their intended path. It will also increase the truck’s stability, so the vehicle shouldn’t be bullied by uneven roads and strong winds. When you combine this with the brand’s renowned StabiliTrak Electronic Stability Control System and the ABS brakes with Duralife rotors, you’ll be willing to take out your new Silverado, no matter the weather conditions. There are a number of additional safety amenities that should eliminate the chance that a driver finds themselves in an accident. The Forward Collision Alert will notify the driver when they’re approaching another vehicle too quickly, and the Silverado can even apply the brakes to lessen or prevent the impact. The Lane Departure Warning will alert the driver when another driver has quietly pulled up beside them, while the rear vision camera allows the driver to monitor all of the happenings behind their truck. In the event that you do find yourself in an accident, the Silverado’s six air bags should prevent occupants from experiencing a painful injury. The accompanying OnStar Automatic Crash Response will also connect the vehicle’s operator to an OnStar Advisor, who can send emergency help to the crash area if necessary. This news is all encouraging for those seeking a Chevy work truck, although we wouldn’t blame you if you’re conflicted on what vehicle you should actually pursue. Either way, we’re sure you’ll be satisfied with your selection, and you’ll be even more content after purchasing that pickup from DePaula Chevrolet in Albany, New York.